(Medical Xpress) -- A key phenomenon studied by neuroscientists is the brains ability to recognize errors when they occur, link them to the associated behavior, and apply those errors in a way that modifies the behavior - the overall goal being to optimize the intended result of engaging in that behavior. Two neural measurements  the error-related negativity (ERN) and error-related functional MRI (fMRI) activation of the dorsal anterior cingulate cortex (dACC, sometimes referred to as the medial frontal cortex)  have historically been seen as reflecting the same underlying neural process. 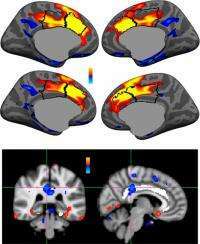 Recently, however, findings by scientists at Harvard Medical School-affiliated Massachusetts General Hospital have suggested that the ERN is differentially localized to the posterior cingulate cortex (PCC). Lead author Yigal Agam and other researchers Matti S. Hämäläinen, Adrian K. C. Lee, Kara A. Dyckman, Jesse S. Friedman, Marlisa Isom, and Nikos Makris  in the Manoach Lab run by Dara S. Manoach  faced a number of challenges in questioning the accepted view. The error-related negativity and error-related fMRI activation of the dorsal anterior cingulate cortex have received a lot of attention as potential neural correlates of learning from errors, which is fundamental to adaptive behavior, Agam explains. Most theories of error processing assume that one is equivalent to the other  that they reflect the same underlying neural process  yet very few studies have attempted to directly examine this assumption. In fact, when we looked carefully at previous studies of where the ERN is coming from, although many studies found source locations that were on the fringes of, or posterior to the anterior cingulate, they assumed a source in the anterior cingulate. This observation prompted the team to more closely examine the ERN and its relationship to fMRI activation  and doing so required collecting data from the same pool of subjects performing the same task both in the MRI scanner and during EEG and MEG recording. Agam points out that another challenge to the interpretation of their findings was that fMRI and data from electroencephalography (EEG) and magnetoencephalography (MEG), which were compared with fMRI in the study, measure different aspects of brain activity  blood oxygenation in fMRI and electrical and magnetic fields on the scalp in EEG/MEG. The researchers therefore needed to be certain that the different localization wasnt an artifact of the different techniques. One possible interpretation of their findings is that the PCC detects errors, gives rise to the ERN, and then relays error information to the dACC to implement corrective behavior. According to this formulation, dACC activation reflects a more general need to adjust behavior and exercise increased control over responses rather than error detection per se. Therefore, models need to be revised to reflect this dissociation of error-processing functions. Significantly, this study is also the first to combine EEG with MEG for localizing the generator of the ERN  an important step because EEG and MEG have different qualities: Unlike EEG, MEG signals are not distorted by the skull and scalp  but due to nature of the magnetic field, MEG only picks up electric currents that run parallel to the scalp. As a result, EEG and MEG are differentially sensitive to neural sources on the gyri and sulci (the ridges and furrows, respectively, along the folded cortical surface). Combining the two methods provides better accuracy than using either technique alone. A range of applications stand to benefit from the groups findings. Since learning from errors is critical to functioning in the world, and many neuropsychiatric disorders are characterized by rigid, repetitive behavior that is not responsive to error feedback, understanding the neural basis of error processing might illuminate the bases of these disorders and suggest pathways for intervention, Agam observes.For example, individuals with obsessive-compulsive disorder (OCD) show an increased ERN compared to healthy individuals. A theory advanced by Roger Pitman1 in the 1980s is that OCD is characterized by persistent and uncomfortable error signals that occur even after correct responses, and this compels behavioral repetition, or compulsions, in an ineffectual attempt to reduce the error signaling. This idea of hyperactive and inappropriate error signaling is perfectly consistent with the clinical picture in OCD: Even though the individual may know that she or he locked the door as intended, they feel compelled to repeatedly check that it is actually locked. All rights reserved. This material may not be published, broadcast, rewritten or redistributed in whole or part without the express written permission of Medical Xpress. That's the fancy way of saying - "ya live and ya learn"
The last two comments are scripts I have no knowledge of - no cognitive associations of mine shed light on this. a- I have to know where you first heard the words you stated here. b- The words are not original formulations. You took what you heard and 'morph' or custom tailored the words to express your frame of mind. All humans do this. (a) "...And don't call me Shirlee." The movie "Airplane", 1980 (Leslie Neilsen). And I think Groucho Marx said it in a movie, too - or on his show from the 50's. (b) "ya live and ya learn". an old colloquialism - origination - who the hell knows. But means that observations and results are generally applicable on a variety of levels (fractal even!). Everything "learns" from a previous "experiment". Think that's the basic description of evolutionary process... and then structures the most used info into clumps for easier access by all elements of a "set". Nature/The Universe/God/et al has a pretty simple masterplan instruction - change,observe, change, observe and so on into infinity.